Welcome to the Dunstable and District Local History Society website. The society was founded in September 1991 and organises monthly meetings where its large audiences are entertained by a variety of speakers. The current programme is included in the events guide on this website. The society also arranges outings for members during the summer months and publishes a newsletter twice a year which contains authoritative articles on local history. The society maintains a research room at the Priory House heritage centre in High Street South, Dunstable, where a collection of Dunstable books, manuscripts and photographs is being assembled. It has also published a number of historical booklets about old trades of the town, including The Whiting Works, by Joan Curran, Dales Dubbin, Flemons' Herbs, Bagshawe's engineering and Cross's paperware, all by Colin Bourne and Shops and Markets by Fred Moore and Don Kemp. Society members also contributed to Dunstable at War, the collection of eyewitness accounts compiled by Jean Yates and Sue King. The latest publication is the history of Priory House by Joan Curran which is now on sale price £2.00. The society meets at 7.45pm on the second Tuesday of each month (except during the summer break) at the Methodist Church Hall, The Square, Dunstable, where visitors are welcome. Annual membership costs £8 (June - December fee £4). Entrance fee for non members is £2 per meeting. This website includes complete reproductions of our newsletters covering a variety of local history subjects . We will be adding to these regularly. There is also a selection of Dunstable photographs. Again, we will be adding to these regularly and also increasing the amount of detail included in the captions. We would welcome any additional information or photographs. Click here to see the latest Newsletter (issue 50). 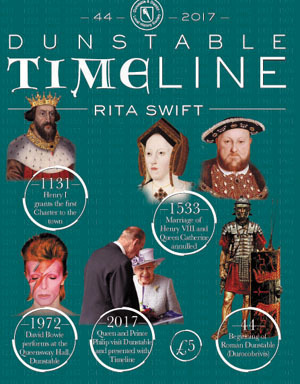 Click here to see our Dunstable timeline. Visit our extensive web photo gallery and if there is something that triggers an old memory, why not tell us all about it.